In addition to our usual Pottery Trial Classes and Pottery Painting Sessions we also run special event days or weekends to celebrate key dates in the year with fun pottery activities and themed food! See below to see what is coming up. Please note: times and availability may vary for our usual Pottery Trial Classes/Pottery Painting Sessions when these events are on. This Easter we will be open Thurs-Sun 10-4 with a range of exciting pottery painting activities for you, fab chocolate treats & spring themed savoury food too! Bunnies and Egg Cups – Book in to paint one of our fab Easter Bunnies or Egg Cups 10-12 or 2-4 Thurs-Sun. (Or paint anything else from our fab range of pieces). Take advantage of our great special Easter Prices! Egg Cups will be just £10 to paint, with small bunnies being £13 and large ones £14.50. We will glaze and fire everything painted over the weekend for collection on Easter Monday. 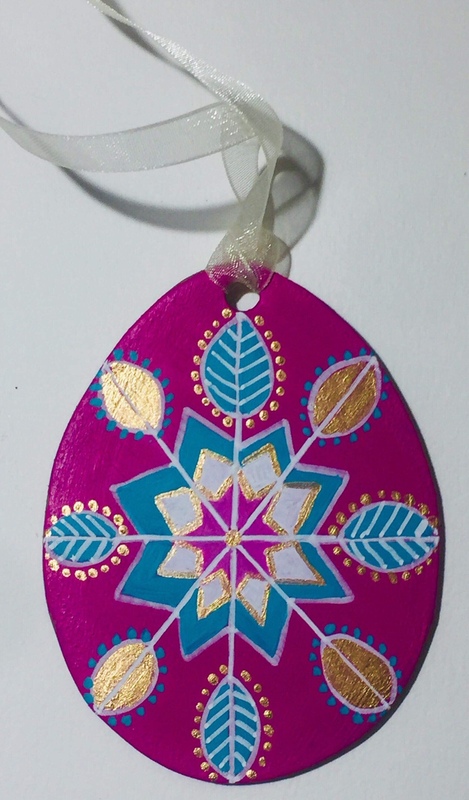 Easter Egg Decorations – Book in to paint a fab Easter Egg Decorations in a ‘Pysanky Style’ (like the picture) and take it away with you! Painting sessions will cost £8 per egg and are bookable 10-12 Easter Sat and Sun all with the help and encouragement of Frances Palmer (who was exhibiting her beautifully painted tile pieces at our Christmas Fayre). And don’t worry – we will have drawn out the design on some of the eggs if you need it so you have something to follow! 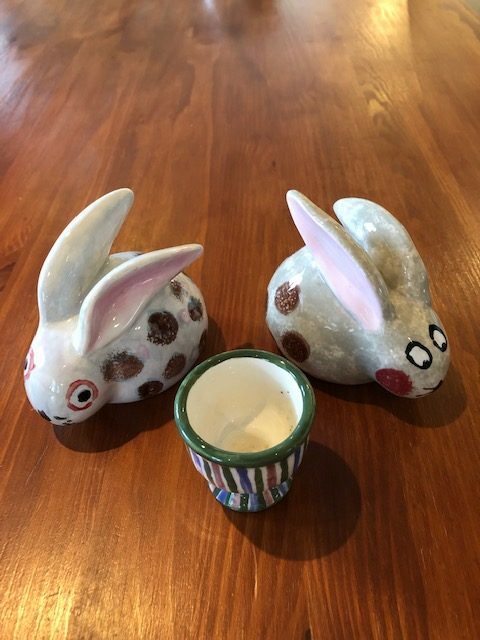 Easter range for sale: If you are not feeling all that creative then come & enjoy the food and Frances will have a range of tiles for sale and we are creating a range of pottery bunnies and egg cups that will also be for sale. Or just pop in for food/drink, a browse or a chat! See you here! Email or call 07974 983908/01594 837943 to book in for our Easter Egg-stravaganza! Turn your thoughts to your summer wardrobe with a co-hosted fashion and food evening with Edge of Heaven Pop Up Boutiques and Hot Pot Pottery. Watch this space for details (and if anyone wants to model for us you will get FREE ENTRY!). Oct Half -Term – Hallowe’en – Scary Pottery Painting and Pumpkin Soup – maybe some ‘Ghoul’-ash!